Here is a TSB for USA SLK 230 on leaking Cam Adjuster. I just had it done. Before I even asked about it, they told me they would inspect ECU, etc. for oil, and they told me that they would replace any oil-damaged component for free. I was going to replace the leaking magnet myself-I have never before paid a dealer a cent for service outside of warranty-but MB of PDX only charged $25 labor. I wanted OEM for this part, as I see posts that other manufacturers have defects. The local dealer actually charged less for the parts (including center "plug" cap thingy) than the discount online Mercedes dealers do, if you count shipping. Given that I would have also had to get the correct anaerobic sealant, clean up the oily mess, etc. $105, total was a very decent price. Interesting. My 2001 model was ex-Japan and MB here have no record of whether it had any of the recalls done, including this one. I took the photo below of my cam solenoid - is this sort of oiling normal for one that has already had the recall service done? I also unplugged the black connector in the centre of the photo and looked for traces of oil in it - there seemed to be a little which I cleaned out, so I presume it's possible that more has been tracking down the loom. Mercedes in New Zealand is providing zero support for this known issue so I'll be unplugging/inspecting my ECU plugs tomorrow to look for issues - none found on a visual inspection of ECU box and fusebox but I guess I have to pull some plugs others have mentiuoned, to be sure. Then I'll be soldering "shut" the stranded wires of the connector near the solenoid end, so that they can no longer wick. Should be sufficient preventative maintenance, leastways I hope so. Hope you find your ecu end all clear. Soldering might be OK, but the harness extension is plug and play, designed specifically to stop the wicking while also providing the proper connection for sensors/computers - working well for this and many other models since the early TSBs. It is less than $25 in US (though actually free from our dealers w/ TSB in hand) - probably cheaper if you shop around online. It's used in many models with this same issue, so probably readily available elsewhere. The solenoid/gasket replacement is also cheap and relatively easy, and needs to be done to stop the leak (though expect it to leak again someday). The earlier TSB .pdf that started this thread has procedure and all part numbers needed. I would definitely go with OEM for these particular parts, and I'd be sure to find equivalent (if not MB-branded) sealant. Many will debate, but posts from dealer mechanics say longevity here relies on this specific sealant. Shop around, don't immediately trust EB or other listings claiming equivalent, and note that you don't need much of it. A 003 989 98 20 10 is also known as loctite 5970 (not 5900 and not clear). PP is now selling small tube of reinzosil (not reinzplast) as equivalent with a very low price, and I'd personally trust that without having done a ton of research. Then I'll be soldering "shut" the stranded wires of the connector near the solenoid end, so that they can no longer wick. Should be sufficient preventative maintenance, least ways I hope so. If they do not have the patch wire in your area the soldering will work. Just strip the insulation for a few inches and solder the strands into one solid wire. A solid wire will not wick where the stranded wires will wick the oil. Then tape each wire separate to replace the insulation you removed. I'm comfy enough with a soldering iron, so that's the procedure I followed - with the stripped portions offset to ensure there's no chance of a contact even if the tape failed. I was fortunate that the ECU showed zero sign of any oil ingress, nor could I see oil on the stranded wire when I stripped it, even though there seemed to be some showing on the connector face. I finished up with Deoxit on the various connectors (ECU etc) that I could readily get at, and I'm happy enough for now. Having cleaned the area around the solenoid I'll watch it to see whether the seal leak is a slow burner or something that demands replacement sooner rather than later. Thanks for all the notes on this issue, very helpful. Glad it sounds like it worked out okay in your case. Maybe this should be a new thread, but it seems relevant, so let's see . Situation is, car is new to me, I'm working through a long list of seemingly common issues, by the looks of the service book she hasn't seen a MB dealer for some years. 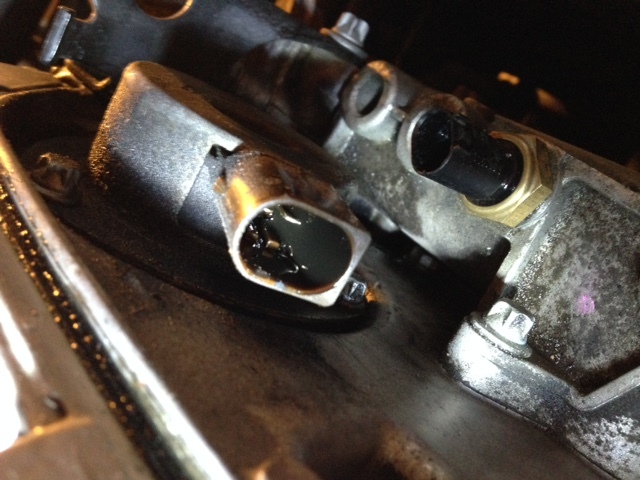 I have this oil leak. I am not 100% sure the local UK dealer won't perform the service campaign, but I discussed the issue with the helpful parts department and bought the harness adaptor, at cost (about 30 quid). They suggested the service department would likely advise changing the whole engine loom as I said it looked like connectors were oily, but we didn't talk about who would pay (presumably me judging on the research I’ve done). How British does this all sound? I just dance around the problem and who's going to pay for it, but in the US, they seem to get it out in the open and just try and get it covered right? Anyway, the solenoid leak is quite bad and looks like it has been leaking for eons given amount of oil over the whole front of the engine, but initially I didn't think it had got into the 'electrics box' when I had a brief look. However, under closer inspection and unplugging the ECU I can see oil, but only on one connector (dense black one, second from right). Removing the connector on the solenoid end, it was swimming in oil, to the point it looks like oil comes out of the connector as well as from around the solenoid mating point. Also the nearby water sensor connector has quite a bit of oil in it. Tracing these back, the solenoid wires Magenta/green goes to pin 8 of the right most ECU connector (thicker wires), but is dry. The other wire brown/grey goes to pin 3 of the dense connector and is presumably the main source of the oil. The water sensor, I don't know if this is an issue, but it might be, starting in the vicinity of the leak. They terminate on the same oily connector, brown/white pin 16 and green/magenta pin 17. To get to the point - I notice the original 2009 service campaign specifies to replace the (perfectly working?) solenoid rather than re-seal it. Is this because the design has changed to prevent it from leaking? If so, I'll get a new one, as well as all the parts mentioned in the 2009 document. I think it worked out about 80 quid for all the parts mentioned. I plan to 'solder off' as PeterWeb mentions, in my case, all four wires at the ECU END somewhere (as I already have oil in the harness). Then at the solenoid end, perform the full 2009 campaign (inc solenoid if really necessary), and maybe solder off the water sensor that end, though that may be taking it a step too far. Just wanted any input/opinion on this (especially if a new solenoid is necessary). I'll use the tips above on sourcing the sealant or it may be easier for me to just pick it up at the dealer with the other parts as long as it's not a crazy price (it does say it will do 25 cars!). - Car is working fine by the way, so I do feel I'm trying to fix what ain't broke at this stage, but I know it must be good insurance. I've gone ahead with the original TSB this evening, and used some 'gel crimps' to hopefully stop any oil ingress towards ECU - seems to start up, so that's something . So no need for any input now, thanks. In US. New to me SLK230 had oil leak and took it to the dealer. For free they installed the wire harness adapter and all parts that had oil at the connector. This included the ECU, O2 sensor, and MAF. But, they did not replace the sensor - go figure. So, I ordered a new one ($80) and installed myself. No more leaks. I still have an issue with going into limp mode if you floor the accelerator all the way. I have an auto. Disconnected the downshift switch on the accelerator and it still goes into limp mode. No codes. Have new pedal assembly coming tomorrow. 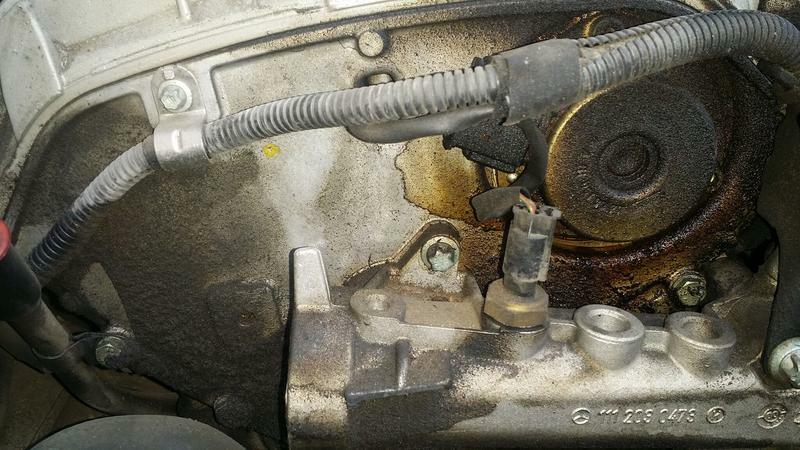 When in for the cam sensor, dealer said transmission lines were leaking and transmission control unit not working. After I cleaned up everything from the oil leak, lines are not leaking. Don't know about TCU but no codes being thrown after reset. Hope this isn't what is causing the limp mode (cost is $600 for part plus programming. I guess this is as good of a place as any to say thanks for this thread and the sticky with the link to the TSBs. I had recurring check engine lights which were getting worse and worse, most centering around the O2 sensor. Using a proper scanner indicated both shorts and opens in the O2 sensor circuit, but I had no idea why until finding the TSB, which led to a search generating some interesting threads like this one. Funny thing is, my car has fairly low miles (~30k) and the engine bay is pristine. There's some minor signs of leakage around the cam solenoid, but not enough to suspect something like this could be happening. But unplugging the solenoid confirmed what was going on-- the connector had a few drops of oil in it, even though the car hasn't been run in a year. Anyone suffering random, unexplained CELs would be well served to investigate this as the possible cause. It's also another example of why a proper scan tool is so useful-- my generic OBD scanner just gave O2 fault codes, but the iCarSoft i980 flat out indicated wiring issues. So... many thanks to those who've contributed (in various threads) to identifying this problem. Hopefully this thread will continue to save others time & money. Speaking of which, does anyone know if MB will still replace the harness at this late date?